A little more than a month after launching the Field project it is becoming a huge incubator for new IOTA nodes. In the past 24 hour alone over 150 new nodes have been launched — all thanks to the generous donations from our sponsors. This is a +25% Field growth! Each time there is a bigger donation and after the payouts we see an increase in nodes count. The node owners I have spoken to see this financial incentive as a chance to launch even more nodes — helping the tangle to grow. Right now the Tangle Tools reports a total of 4.4TB RAM and over 2700 cores diligently working in the Field serving users and doing transfers. Just in the past two weeks over 31.1Ti have been transferred through the Field — that’s over 1% of all existing IOTAs! As for the total amount of IOTA nodes, we can confidently say that the Field Server at this very moment “sees” over 1,800 IRI nodes: Field servers and all their 1st-tier neighbours. The total amount of all IOTA nodes will definitely be higher. Since many, if not most, of the nodes run Nelson for automatic neighbours management, it is interesting to watch, how the Field “tangle” morphs over time, constantly changing the connections. It prevents node clusters and unnecessary reattachments. The Field’s reattacher barely had any reattachment work to do — just promotions. Good job, Nelson! 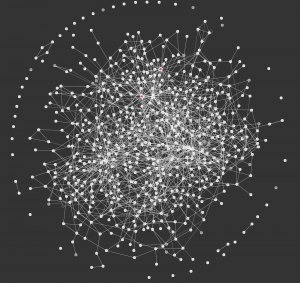 I am also happy to see that my own “entry” (master) nodes (coloured pink in the image below) are not in the center of the Field universe and oftentimes land on the very edge of the graph. Especially when there are not so many new nodes added over a period of time. This is as it is supposed to be — once the new nodes have enough neighbours, they rely less and less on the entry nodes. We had a few hiccups in the past weeks with the donation payments, as all of them are done in one monster-bundle. This is too big to swallow for most of the IRI nodes. We will continue generating those bundles manually until a sequential payments system is ready and tested. There were two Field misuse cases with huge traffic spikes. They were identified and the possible attack vectors fixed. The load balancer reacted correctly, scaled up to 20 instances and swallowed the load easily. This kind of stress is necessary for any new software. Lessons learned, moving on. We envision a future for public Fields where they auto-organise and pass the workload between each other. Each Field could auto-discover and connect other Fields just like Nelson. This would create a mesh of Field load balancers, a higher abstraction layer for IOTA, a Field-p2p-Network, protecting the underlying nodes and optimally distributing the workload on a global scale. A “smart” wallet would be aware of this Field-p2p-Network (optimally, being a passive member) and always select the nearest trusted Field that is online. A premium/private Field could offer higher trust, security, speed and availability to it’s users, providing IOTA Infrastructure as a Service (IIaaS) for industrial and business applications. Much work is being done in that direction. However, it is a huge endeavour in itself — way bigger than the Deviota “wallet”. As always, we will continue adapting to the changes and focus our limited resources on the most pressing issues. Our primary aim is still to build a solid foundation of tools for this awesome technology. ❤ IOTA!